Many of us find it difficult to be alone with God because we are not sure what to do and have no idea what to expect...there is no reason to be afraid of drawing closer to the God who is love. 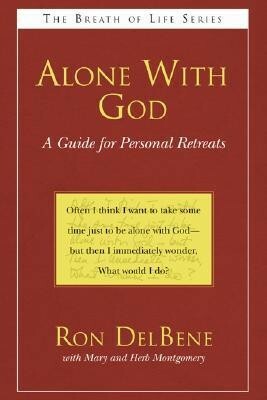 Alone with God was written especially for people who have the desire to spend time alone with God and to be more attentive to God's presence in their lives but do not have a practical sense of how to begin. Drawing on his background as a spiritual leader and retreat leader, Ron DelBene has a format for personal retreats that is flexible enough to be used in a two-hour block of time or expanded to as many as eight hours. He explains each part of the retreat format in detail, providing a thorough understanding of what is to take place and how best to put it into practice. Twelve retreats explore different themes, such as Seeking Forgiveness, Overcoming Anxiety, Called to Serve, Freedom - all designed to guide participants through their time alone with God. Ron DelBene has been doing spiritual direction and leading programs in the area of spirituality and pastoral care across the country since 1963. He holds a Master's agree in Theology and a Doctor of Ministry degree in Spirituality and Organizational Systems. He is a poet, artist, author of books and videos and an Episcopal priest. With his wife, Dr. Eleanor McKenzie DelBene, he directs The Hermitage, a non-profit corporation devoted to providing spiritual growth and direction. Ron and Eleanor have two grown children, Paul and Anne. Paul and his spouse, Gayle, have a daughter, Matsue, and a son, Luca. Mary and Herb Montgomery are professional writers who make their home in a suburb of Minneapolis. I'm the author/artist and I want to review Alone with God.